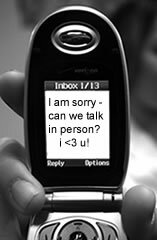 Cell phones and the impersonal internet have become the easy way to break up. Or so we think, but having a true discussion that ebbs and flows is virtually impossible with the texting phase. One is unable to see the facial expressions or even the subtle body cues. A person can always say one thing and mean something else. I agree with you. True discussions move people over time, texting does not generally move the discussion with couples into positive territory. 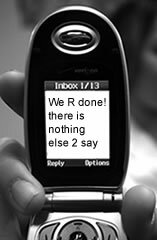 Let keep text messages on cell phones limited to logistics!